For some of the work in the festival, it is necessary to experience it evolving and unfolding over time in order to take it in. Others work with the power of the image, in which all the necessary experience is immediately apparent, though it may take time to absorb. Sometimes this power comes through simply the forcefulness of the concept, as in Rob Boole’s fixed frame video of the artist steadfastly chewing his way through pieces of raw meat, stopping only to belch or gag, then carrying on. 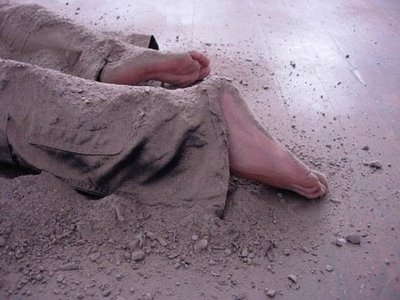 Other work gains power through a careful control of composition, as in Mark Greenwood’s work (described above) or in Ula Dajerling’s tranquil performance of a clothed female body, lying face down on the wooden floor, covered in fine dirt. This was a perfectly judged image, the soil softly muting all colour, as Dajerling’s breath slowly rose and fell in the birdsong and clear light of the afternoon. Also effective were works in which the spectators were incorporated within the composition. In ‘Two basic assumptions of this theory’, Jessica Morris piles cinder blocks to build a wall immediately in front of her audience. On the back wall, a projected image shows shadow figures labouring maniacally, superimposed over each other. 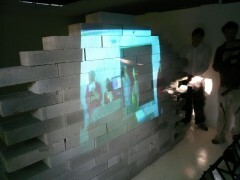 Gradually it becomes apparent that a live image of the audience is being projected onto the brick wall as it is constructed; we are periodically blinded by high power floor lights, and in the lingering afterglow are able to see more detail in our mirror image before we fade again into shadow. In Oliver Irvine and Amy Thomas’s ‘You Decide 2#’, the implication of the audience is given political relevance. Described as an ‘Orchestrated Interrogation Circuit’, the piece features a female figure in an orange jumpsuit suspended in a harness, her legs forcibly spread apart. Throughout the room, there appear to be bodies crumpled on the floor under black cloths. On the back walls, a figure in a yellow radiation suit paints the same motif over and over again, slowly darkening the walls with its broad splashes of paint. But this whole scene is largely obstructed by clusters of painter’s easels, prepared with paper and pieces of charcoal. As the sound of hymns and prayers comes over the sound system, blindfolded spectators sit at the easels and begin to draw. It’s not clear if the first to draw were instructed to do so, but as they leave, other audience members volunteer to take their place, covering their eyes to an image that is impossible to ignore, putting charcoal to paper, and sketching their testimony.